← Accountability Post #8 ~ To Reach that Goal ~ #amwriting #selfpublishing #havetakenaweekoff! 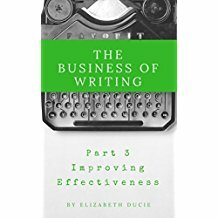 I have always been impressed by the professionalism of Elizabeth Ducie so when I had the chance to be an early reader of her business books I jumped at the chance. I have therefore received a free copy of this book but that has no bearing on the content of my review. I am as easy distract as a kitten is with a laser, so this part of the series was probably the most useful for me to read. It starts by doing an excellent job of telling you to be kinder to yourself, which is always good to read if not easy to act upon. Imagining each writing task as a project this book shows you how best to manage that project using various planning methods. It also discusses time management which I can struggle with as having so much to do I can lose focus, panic and end up getting nothing done. You can learn how to differentiate between Musts and Wants as well as Urgency versus Importance. It is this section that I am going to reread and put into action. This is followed by a problem-solving section which introduces some useful methods of working out a solution, and ends with a Miscellany, for odd bits and pieces, and with a useful section on Scrivener which I’ve never used but am intrigued to find out more about. As always with Ducie’s business books this is filled with concise, useful information and I’m sure anyone reading this one would definitely find something in it to help improve their effectiveness. Highly recommended.